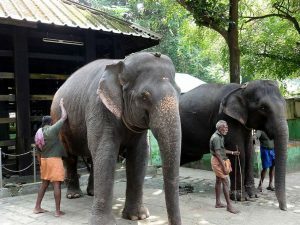 Exciting Private Day Tour from Kochi / Cochin to visit the Kodanad Elephant Training Camp / Abhayaranyam and Paniyeli Poru. A personal chauffeur picks you up from your Cochin / Kochi hotel lobby or from the Kochi Port Cruise Terminal around 8 am in the morning and drives you nearly for an hour to reach the Elephant Training Camp / Abhayaranyam near Kaprikkad. This day tour also takes you to Paniyeli Poru. Kodanad, the headquarters of Malayattur Forest Division, is a secluded but modern village en route to Munnar located nearly 50 kilometers east of Kochi, Kerala. This beautiful place is on the banks of River Periyar and known for the “Elephant Kraal” or the “Elephant training camp”. Kodanad is a famous tourist place in Kerala because it is the only elephant training center in the state where baby elephants are trained. Elephants that found from the forests across the place are getting trained at Kodanad Elephant training center. These trained elephants are used to carry wood from the forests. In Kerala, elephants are considered as an auspicious animal and a vital part of the culture. A massive elephant procession is an integral part of every major festival or celebration in the state. Elephants are revered, loved and groomed in the state with utmost care. Keralites often referred them as the ‘Sons of the Sahyas’ (in reference to the Sahyadri Hills). They are often referred to as the ‘Sons of the Sahyas’ (in accordance with the Sahyadri Hills). Now moved to Abhayaranyam near Kaprikkad, the Kodanad Elephant Training Centre is among the largest elephant training centers in the state. Kodanad was a major elephant training center in India during the 1950’s. The government banned the capturing of elephants and twenty years later, it became a center for training baby and young elephants that were rescued from different areas of the state. Kodanad is started to house other animals and birds also in addition to elephants for developing it as a mini zoo. Since the animals and birds increased significantly, it became difficult to keep all those animals in the 2.5 acre Kodanad Training Centre. So, all the animals were moved to the 200 acre Abhayaranyam. Finally, Kodanad Elephant Centre closed for good. Tours to the Abhayaranyam mini zoo is an enjoyable experience for visitors. 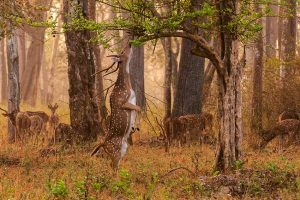 It is located in the middle of a forest with areas allocated for various animals such as elephants, sambar and spotter deer. Nearly 100 acres of this forest adjacent to the Periyar River are allocated only for elephants. In fact, Abhayaranyam has sufficient area for the elephants to roam around freely. 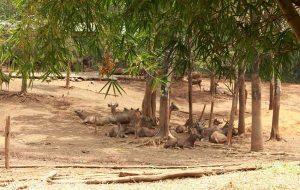 There are large fenced areas in this mini zoo to house spotted deers and sambars. Aside watching a small variety of animals, Abhayaranyam also has trails inside the forest for enjoying hiking. This mini zoo is still in the process of expansion, aiming to develop it as a great wild safari destination just like other popular national parks in the country. A trip to Paniyeli Poru is an exotic travel experience for everybody. This untouched picnic spot located on the outskirts of Kochi is a perfect place for avid travelers who wish to take a break from their hectic schedule. There are so many alluring things in this quiet and peaceful place where visitors can enjoy complete refreshment in the lap of Mother Nature. It shall be mind-blowing to watch the milky waterfall from a distance. Even the pebbles of this place can surpass the beauty of precious stones. You can see many fascinating rivulets with clear streams of water in this area. The scenic nature in Paniyeli Poru can wash away all the weariness and worries of everyday life. Visiting this beautiful place in Kerala is a great way to see different shades of nature. Paniyeli Poru is a place touched and nourished by the beautiful River Periyar that flows between the Paniyeli in the south and Malayattoor in the north. This place got its name from the regular fights of rafts men with the wild waves of the river. Even river offers a picturesque view of this beautiful spot. Bamboos were cut and tied in this region as logs in order to form a raft. The rafts- men needed to battle with the rough waves when they carried these bamboos to Malayattoor and other places through River Periyar. In the local language Malayalam, poru means fight and the place got its name because of their fight with the waves. Paniyeli Poru is not only blessed with alluring nature but this region is also home to plenty of animal and bird species. The twittering and chirping of birds, the music of waterfalls and rivulets all blend together perfectly to compose a harmony at this place which certainly relieves all your worries and tensions. 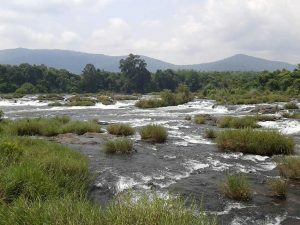 You will also admire the view of the winding paths of River Periyar along the rocks and dense forests. Paniyeli Poru is also a treat for the photographers. Blessed with warbling birds, canopy of trees and beautiful rivulets, this place is a delight for photographers to recapture numerous captivating things in many frames. Elephant rides or any other interaction with elephants is not allowed at Kodanad.